He came home on a Tuesday, three days before our 10th wedding anniversary. I refused to pick him up from the airport. I was extremely weary, and wary of his intentions. My behavior was anything but stellar. We met for dinner at our favorite local pub the night he returned. Halfway through, we started arguing, which evolved into a huge fight, which escalated to me screaming expletives (surprise!) in his face. I quickly left. He followed after me, and I responded by kicking him in the shins. Things got a bit better the next day, when we returned to marriage counseling. Through another two-hour session, my husband expressed his desire to be in the marriage, and said he was back to “do this” with everything in him. Clinging to Hope, Part Three, I had faith that God could, and would, renew my marriage and resurrect our relationship. Still, I had trust issues. It is the eve of my 10th wedding anniversary, I wrote. I want so much to pretend it’s just another day, but it’s not. Is this my final year of being married? How many more months or years will I endure [his] apathy? Oh, God, I mourn the loss of [him]. I miss him so much. I miss my loving husband who didn’t care what anyone thought. I suppose I deserve it. I just have to treat tomorrow like any other day. God, I know you love me even if [he] can’t. He may never again – I can’t bear his apathy. Suffering from jet lag, my husband went to bed early that night. While he slept, I found a note that he had written to himself. It was neatly printed on a small, lined piece of paper. I don’t quite remember if I was snooping through his belongings, or if he had strategically placed the note so that I would find it. His words made me gasp for air. I have since burned this particular writing, but I recall reading that he did not love me anymore. At the same time, he still loved me. He dubbed himself a liar, and wondered why he had ceased caring — even about his family. In the end, he concluded that there were more exciting things going on in his life than his marriage. I felt like such a fool. I immediately fled the house, note in hand. I had no idea where I was going, but I needed shelter. I “followed the windshield” and ended up at my in-laws’ house, just two miles away. My mother-in-law didn’t react to the note. She didn’t see anything wrong with it. I was confused. Still, I asked to stay over that night. I couldn’t go back home. He has no energy to make the marriage work because there are more exciting things, I wrote, sitting cross-legged on my husband’s childhood bed. LORD, I want so much for him to be broken. But he is not there. I give him to You. I set him free. I will set him free. God, I don’t know what to do otherwise. He doesn’t love me, he doesn’t see anything about marriage beyond a history and that he once loved me. He fell out of love with me. Lord, I know that You will never fall out of love with me. God, I don’t want to be divorced but I cannot endure this treatment any longer. I don’t know what else to do. [He] is paralyzed, incapable of making a decision. But he doesn’t WANT to make a decision. I don’t want someone who is apathetic. I don’t want a husband who just sticks with me because we had a history. I don’t want a liar and a cheater for a husband, and certainly not one who is incapable of action, especially forgiveness. The next morning I lay in bed and stared the large, intricate collage of family pictures hanging just above me. Depicted as nothing other than the happiest of couples, my husband and I adorned the wall. Ten years earlier, I had woken up with such hope, excitement and anticipation for the future. Vivid memories of our wedding day flooded my mind. 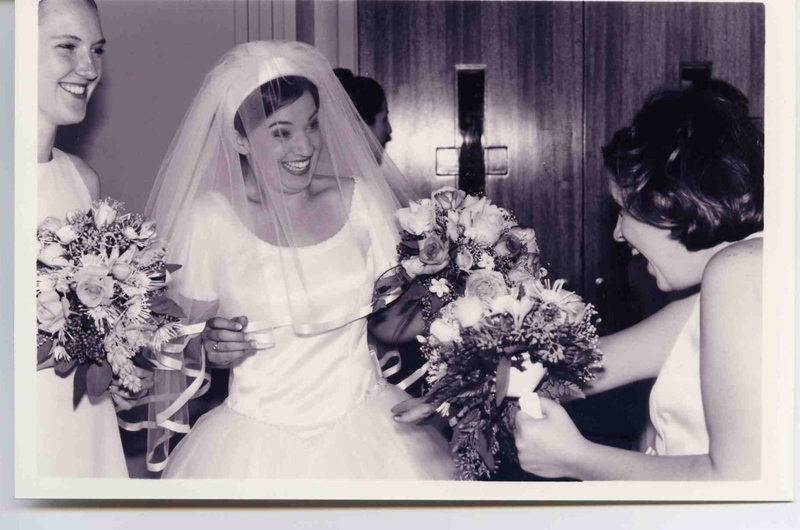 I remembered goofing off with my bridesmaids just before the church doors opened and the organ blasted; I remembered how much my face hurt from grinning as I floated down the aisle. I remembered how my husband and I enthusiastically recited our vows to one another, and then became overwhelmed with joy and amazement just after we had been pronounced “Husband and Wife.” I recalled the faces of our wedding guests, even what some of them wore. I chuckled at how our wedding cake toppled over in the unseasonal heat of that late October day, and genuinely laughed at the memory of my husband shoving his hand down the front of my dress as we drove away, bound for our honeymoon suite. I dragged myself out of bed, still fully clothed, and drove home. I slowly climbed the stairs and quietly slipped in through the back door. I didn’t think my husband would be awake, much less notice that I had been gone. Yet there he stood. He greeted me eagerly and presented me with a dozen red roses. A note accompanied the large bouquet. This note was vastly different from the last one I had read. He called me his wife. He knew he had failed me, but I still loved him, and that was beyond anything he felt he deserved. He wanted to do me justice. He wanted me to soar. Most poignant to me was that he said he loved me. So, in that moment – that day – things were better. We had made it to Tin / ten years.Our “celebration” was not spectacular. It fact, it felt just like any other day. Yet it was refreshing to behave as a couple again. We went out to breakfast with my mother-in-law (yes, weird), strolled with our dog, Wimbley, around the Rose Bowl, shopped for socks and T-shirts, scarfed an early dinner at happy hour, and patronized the indie theatre to catch Nick Hornby’s An Education. It would be the second time I had seen the film. It was a fine anniversary, I recounted. We…made love, which is still hard for me but I want to trust [him]. I don’t know the correct formula for healing sexually after an affair (but) I don’t want to hold it over both of our heads for years and years.There have been small steps and some progress. I don’t want to give up…I so very much want him to become a godly man.I want to be married to a godly man.